Education Minister calls on gov't to use 'full force' of IDF to punish Hamas terrorist organization for rocket attack on central Israel. 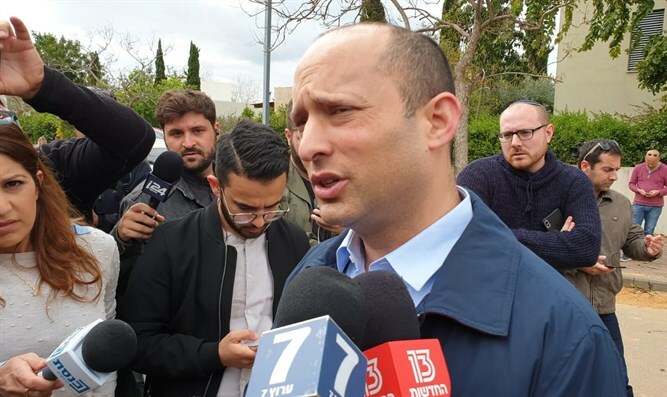 Education Minister Naftali Bennett (New Right) called on the government to retaliate against the Hamas terrorist organization, following a rocket attack on central Israel that left seven injured. “Hamas has established a full…terror state in Gaza,” said Bennett as he visited the home in Moshav Mishmeret in central Israel that had been hit early Monday morning by a rocket launched from the Hamas-ruled Gaza Strip. The rocket fired Monday morning landed some 50 miles from the Gaza Strip, far deeper in Israeli territory than most recent rocket attacks. The incident prompted Israeli Prime Minister Binyamin Netanyahu to cut short a visit to Washington and cancel a planned address at the annual AIPAC conference. "Several minutes ago I concluded a telephone update and consultation with the Chief-of-Staff, the head of the ISA Director and the head of the NSC,” Netanyahu said Monday morning. “There has been a criminal attack on the State of Israel and we will respond forcefully. In light of the security events I have decided to cut short my visit to the US. In a few hours I will meet with President Trump; I will return to Israel immediately afterwards in order to manage our actions from close at hand." Hamas officials have claimed that the rocket was launched by accident, telling Egypt that the terror group would investigate the incident thoroughly.